We're known for taking the hassle out of travel by providing both a stress-free service and ultimate value. That's why we're now giving away seasonal travel packs to all Airparks customers to make travelling even easier. For a limited time only, you can pick up a FREE travel pack if you purchase parking at an Airparks car park between 25th January and 7th February 2010. Don't let the current climate defeat you. We're giving away FREE Airparks Winter Packs containing de-icer and a scraper to all customers. If you've already had enough of those frosty days and nights, you won't want to face it all over again after a relaxing trip. While others are struggling to clear their cars, you can enjoy a quick getaway on your return. We're all prone to forgetting at least one summer holiday essential - unless, of course, you're incredibly organised. Well, for those that aren't perfect or for those that forget to pack enough - you can take advantage of a FREE Airparks Summer Pack. In a useful drawstring bag, you'll get a travel adapter, ear plugs and an eye patch - something useful for all. 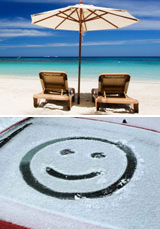 If your car is staying at Airparks before April 1 2010, you'll receive a FREE Airparks Winter Pack with your booking. If you're car is staying after April 1 2010, you can pick-up a FREE Airparks Summer pack - ready for your spring or summer break. To claim your FREE pack, all you need to do is present your printed booking confirmation to reception staff at the Airparks car park. Book your parking at an Airparks car park today to take advantage of this limited offer. Check out a list of our car parks below.